Have you wondered why your resume doesn’t get noticed? Are you curious regarding how a recruiter “examines” your resume? Interested in the resume killers? 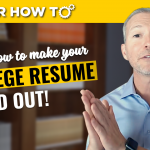 Join career expert, motivator, and award-winning author Andrew LaCivita as he discusses how to get your resume noticed in 5 seconds guaranteed! How do you review a resume? Side note: If I can sum up my entire 28-year career in 26 words, you can summarize a 50-year career in two pages. If you think you can’t, you are mistaken. What’s the 5-second magic pill!? 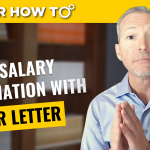 Check out the video for much more on this topic! You can join the resume course + workshop here! 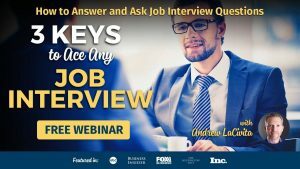 Free Job Interviewing WEBINAR: I’m offering a FREE WEBINAR titled 3 Keys to Ace Any Job Interview. It comes with great instruction and a nice workbook for note taking. Even more, I have an awesome giveaway when you attend. It’s an eBook titled Ace Any Job Interview. There are several times available. Hello Andrew. I enjoyed your videos, very informative. I wanted to offer a couple of suggestions that may make your video presentations a little better. 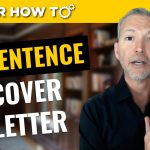 Your videos are nicely lit, but motion such as a Fed Ex truck zipping past a window or tree branches blowing in the wind can distract your viewer from your presentation. It’s the equivalent of an objective statement at the top of the resume! With regards to composition, the viewer can draw a vertical line through the center of your videos. It starts with your shirt button/zipper straight up to your nose and continues with the corner of the room up to the ceiling. When your face breaks that perfect alignment by naturally moving off center to one side or the other as you speak – it again becomes very distracting. So, watch for lines, or objects in the background that may look like they are poking out of your head when viewed on screen. Other than that, you have a good energy and a smooth flowing message. Keep up the good work! I’m off to re-design my resume. Max, thank you for the kind words and glad you like the content. I will also keep in mind those suggestions about the movement in the background!!! Hey Andrew – All of your videos have been beneficial- and on an upbeat tone, so THANKS! Question about the abridged resume style- how does that “handle” the new technology word scan that will filter OUT resumes that don’t match over 80% optimization? Do we change the one or two bullet points – our HIGHLIGHTS- to get more word match with their job posting/requirements? Again, hope you feel the appreciation from so many people that are just building a better life for themselves – and YOU have been a sometimes silent partner in it- so Thanks! Hi Mike, thanks for the kind words! First point, would be I’m not recommending an abridged resume style. It’s a full-out, complete resume. 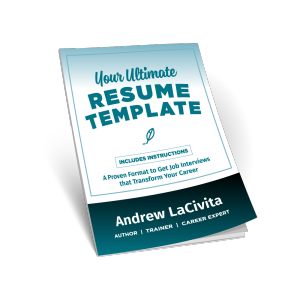 Check out exactly how I recommend that here (if you haven’t seen this already): http://milewalk.com/mwblog/build-ultimate-professional-resume-andrew-lacivita/. 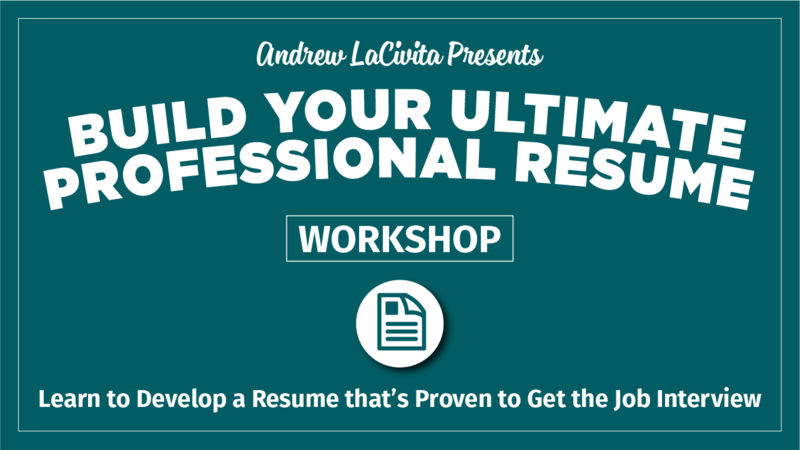 I also have a workshop dedicated to this: https://www.milewalkacademy.com/p/build-your-ultimate-professional-resume-workshop. 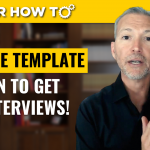 Second, if you are loading your resume into an ATS that might be sensitive to keyword matches (or even recruiters who are sensitive to keyword matches), you should check out https://www.jobscan.co/. That will help you determine the overall “keyword” match to see whether the computer feels you’re in alignment. Hope that helps!! !